There are 3 holidays to Desenzano for 2 adults, 0 child and 0 infant. 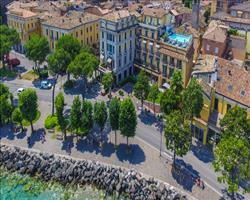 The largest town on Lake Garda, Desenzano offers the best of a beautiful lakeside setting in a vibrant thriving Italian atmosphere. Favoured by the Italians, it has remained unspoilt by international tourism and is the ideal place to stay if you want to really immerse yourself in Italian culture. Desenzano reviews, 5 star rating and resort and summer area information is collated by SNO man from staff experience and customer feedback.